February’s meteorite landing near Chelyabinsk not only put that city on the map, it also highlighted the rise of the dashboard camera in Russia. Thanks to these cameras, the meteorite was shot from so many angles that it looked like it had been filmed by a Hollywood studio. Dashboard cameras, or “dashcams,” are small video cameras that are mounted behind the windshield to continuously film everything that happens in front of the car. In the event of an accident, it acts as an independent witness to what took place and is also an effective way to counter corrupt traffic police. The Russian Internet is awash with videos of a particular type of insurance scam whereby drivers use their own cars to stage traffic accidents. Tragically, pedestrians have recently become involved in these scams, risking their lives for the sake of compensation by leaping in front of moving vehicles. It is not just about staged accidents though: the ability to film corrupt police, terrifying accidents, fighter aircraft and helicopter gunships flying over the road make dashcams a must-have. The development of technology has also played a role. These cameras can now be bought at any electronics store, not to mention at countless online stores. 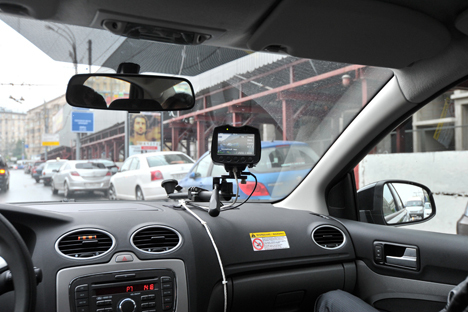 Prices start from 700 rubles ($22), and for $25 drivers can buy a fully equipped camera (without a screen), which records video in 720x480 and also records sound. More expensive cameras shoot in full HD, and recordings can be played back on a small screen. Judging by the number of views for dashcam clips on YouTube, a “Russian Roads” reality TV show would be a sure-fire hit. If you search for “dashcam recordings,” you will find a whole host of videos showing accidents, road-rage incidents, serious traffic violations, and even plane crashes. There is a separate category for traffic violations committed by officials in company cars. Dashcams are also an essential tool for the Blue Buckets grass-roots movement. The Blue Buckets advocate the abolition of flashing lights, which give some officials right-of-way privileges; they also advocate the use of dashcams, and encourage motorists to report incidents to the police and submit videos of violations. “In Russia, appending video recordings to road traffic cases can have mixed results,” says the coordinator of the Blue Buckets society, Peter Shkumatov. “If you have filmed someone running a red light or driving into the oncoming lane, no one will examine it and the offender will not be punished; but if that person is involved in an accident, they’d be happy to take your recording. Not only social activists are uploading clips of road traffic violations, but also the offenders themselves. These would-be-heroes film their reckless driving and then post their videos online. A man nicknamed the “Black Devil” used to drive like a maniac through the streets of Moscow on a sports bike, filming everything on his dashcam. YouTube videos showing his GTA-style antics attract millions of views. Sometimes the “Black Devil” is shown driving a Porsche Cayenne Turbo, but his driving style remains the same: insane lane changes on busy roads, veering into the oncoming lane, running red lights and evading the police. These are the hallmarks of his video clips. In February, the racer was caught and identified by police as Moscow student Nikolai Mustafin. He has already been given 16 days of administrative detention, but the police are still examining the incidents recorded in his videos and have told him that he faces big problems. Earlier this year, an initiative of the Orenburg Legislative Assembly caused quite a stir. The Orenburg deputies proposed to the State Duma that an amendment be made to the law prohibiting any foreign object from being placed on a car’s windshield and side windows. This would be punishable by a fine and confiscation of the foreign object concerned. As the bill does not specify exactly what is considered a foreign object, satnav (satellite navigation systems) and dashcam owners have raised the alarm. The bill was not passed in its first reading, and requests were sent to various committees and bodies of the legislature and executive, in order to gather comments and opinions on the matter.